Banqs is a seating collection designed to accommodate multi-purpose settings, from focused work to informal meetings and social gatherings. The collection is comprised of sofas, screens, tables and accessories that create linear seating, hubs and booths for use in corporate, educational and public spaces. Banqs can be used to form multi-use spaces adjacent to workstations, or as a designated meeting area, lounge area or cafeteria. Its versatility provides an opportunity to convert existing but under-utilized real estate into multi-use zones, maximizing space optimization. 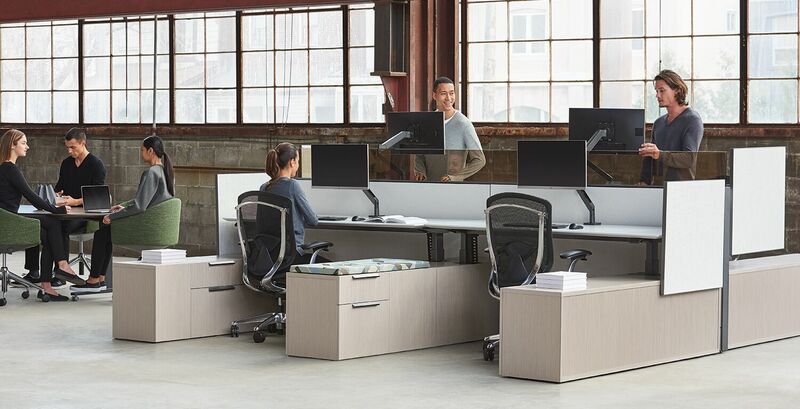 Banqs recognizes the current A&D desire for a single, mixed-collaborative setting that addresses many contemporary workstyles. The aesthetic tone is casual and domestic, while its performance is of a commercial caliber. Banqs provides designers with the tools to create simple standalone layouts, or to integrate with the building architecture and to customize for tailor-made applications. Banqs can be specified in various environments, spanning traditional markets of corporate, educational and public spaces, to emerging markets of startup and coworking. It can be planned in linear, back-to-back U- or L-shape layouts. Freestanding units establish a social destination while back-to-back applications maximize planning and occupancy. Ideal for public or corporate settings, Banqs works in concert with Zones lounge chairs and tables to create a comfortable lounge area. 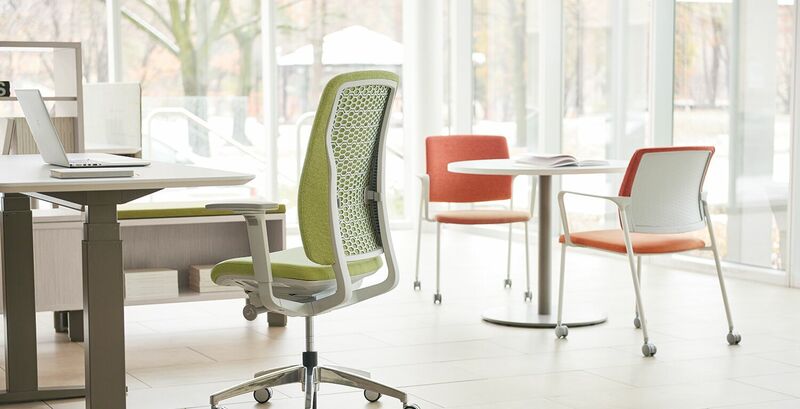 Like Zones, Banqs was designed by the London-based PearsonLloyd studio in conjunction with Teknion. Three different back heights allow varied sightlines across the floorplate, levels of privacy and aesthetic. Screens float off the floor, allowing flush application against walls with baseboards up to 7 inches (17.8cm) high. Bench legs provide a light, domestic appearance. Modular 48- and 72-inch-wide (122 and 183cm) benches designed for back-to-back, linear and 90° corner applications comfortably seat up to three. Varied options for electrics, A/V integration and accessories such as lights provide the ability to tailor the functionality to suit customers’ unique needs. The ability to reconfigure and expand a layout is ideal for growing organizations, as Banqs is less costly and disruptive than renovating architectural millwork. Banqs can be specified in various environments, spanning traditional markets of corporate, educational and public spaces, to emerging markets of startup and coworking. 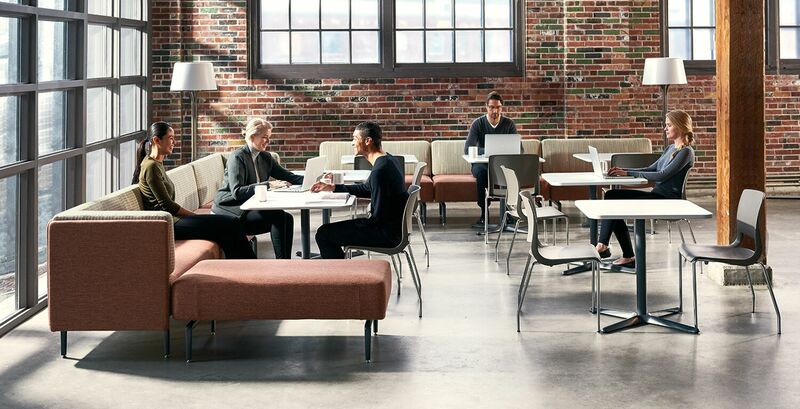 Teknion has expanded the Around offering with guest and casual meeting seating. The new seating is ideal for multiple applications including workstation environments, private offices and traditional reception areas. Around guest seating is available with two back styles – mesh and upholstered wrapped. 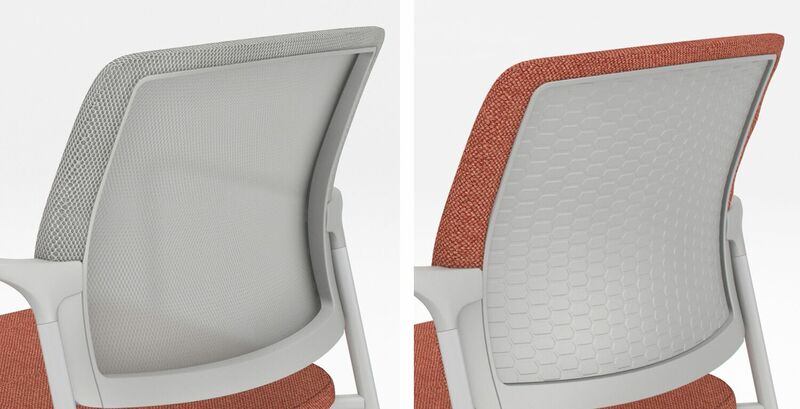 The upholstered seat’s enhanced foam depth is hidden below the frame profile for additional comfort and a sleek profile. Teknion continues to expand the integration of its height adjustable options within its furniture systems. Last fall, Teknion announced the integration of Navigate height adjustability within upStage. District and Leverage are the latest systems to also feature integrated height adjustability. As with upStage, District and Leverage height adjustable-ready credenzas with multiple storage configurations and various Navigate leg applications support both perpendicular and parallel planning. Highlighting these leg applications is the new Navigate Gable Leg. The Gable Leg, a sister product to the Expansion Bevel Base, is available as an integrated leg application in District, Leverage and upStage. It is also available as a freestanding configuration within the Navigate offering in Complements. 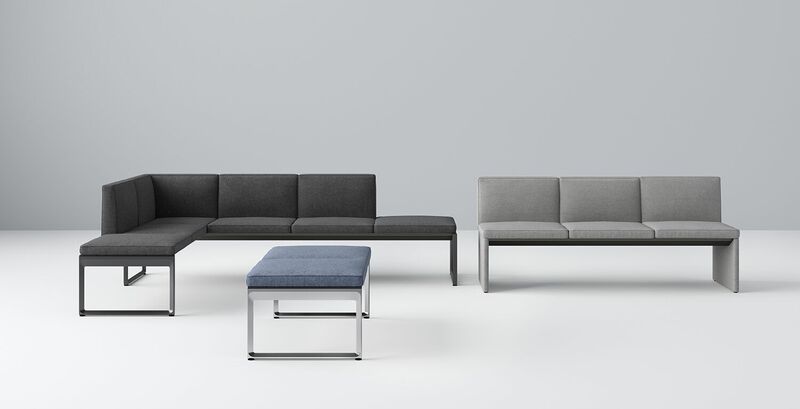 Clique from Studio TK is a highly versatile benching system, featuring benches with or without backs, as well as sectional benches in a variety of configurations. 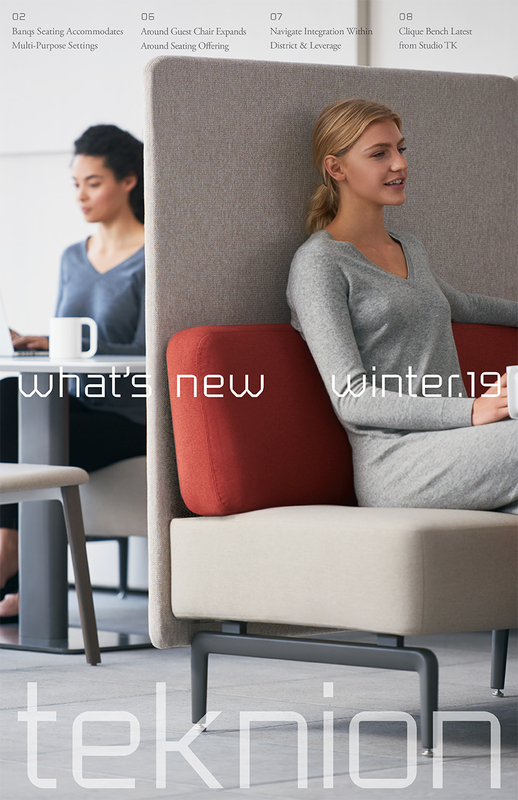 Clique is ideal for perimeter benching in meeting rooms or cafes, back-to-back booth scenarios or standalone benches in a lobby. Designed by Mario Ruiz, Clique seating displays a subtle, thin geometry perfect for impromptu meetings or conversations with coworkers. The collection creates more agile environments for the mobile worker. Clique’s seat, back and base can be upholstered in different fabrics available from Luum Textiles, plus COM/COL. Metal base finishes include Polished Aluminum and powder coat. Designed by Mario Ruiz, Clique seating displays a subtle, thin geometry perfect for impromptu meetings or conversations with coworkers.